I’m a computer nerd, wife, mother of two young adults, and servant to a couple of cats. I live just outside of Toronto, Canada. I am crazy for miniatures, birds and geography. And making jewelry, of course. I discovered jewelry making in 2009 when I bought some beginner tools and beads for my daughter. She looked like she was having so much fun so I gave it a try, and proceeded to, as she says, “steal her hobby”. About 2 years ago, I discovered fire. Or, more accurately, I discovered soldering and all the possibilities it opened up. 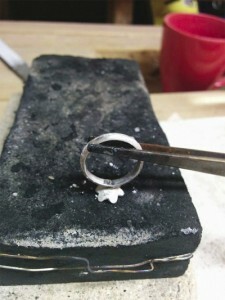 I’ve been a metalsmithing lover ever since, and I am always trying to develop new skills. I’ve been crafty and artistic all my life. I took to art at a young age, and tried out various media (sketching, acrylics, pastels), delved into pottery, sewing, knitting, crocheting, embroidery and needlepoint, to name a few. I focus on making quality, affordable pieces in classic designs that you can feel good wearing for years to come.